Chandrapur District Malaria Officer’s Office (Arogya Vibhag), Chandrapur published a new job notification for Health Worker Posts. The recruitment is for total 65 Vacancies. The willing candidates are informed to see the latest notification February 2019. Last Date of online application is 18-03-2019. 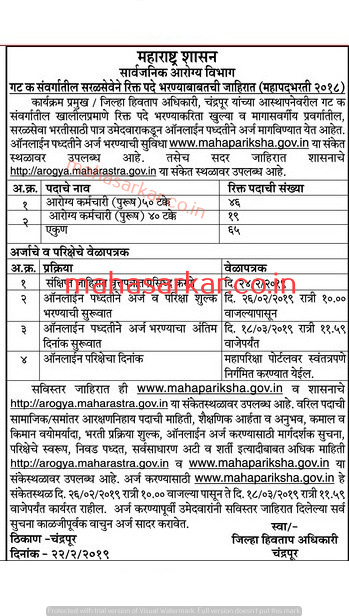 For More details of Chandrapur District Malaria Officer’s Office Recruitment 2019 Read Below. चंद्रपूर शासन सार्वजनिक आरोग्य विभाग मध्ये बिबिध या पदाच्या एकूण 65 जागांसाठी अर्ज मागविण्यात येत आहेत. ऑनलाइन आवेदन करने की अंतिम तिथि 18-03-2019. रिक्त पदाचे नाव: आरोग्य कर्मचारी.